Havana Vieja - Cuidad en Movimiento, "City in Motion" is a long-running international dance festival that takes place each spring in Havana. The festival celebrates street dance with companies and schools coming from all across Cuba and around the world to participate. It is a venue to exchange ideas, styles and techniques of dance. There are conferences, talks, free workshops and of course performances. This spring will be the 20th anniversary of the festival. Below, a workshop on Popular Cuban Dances (mambo, son, pilon, etc.,) led by the Ballet Folklorico de Camaguay. 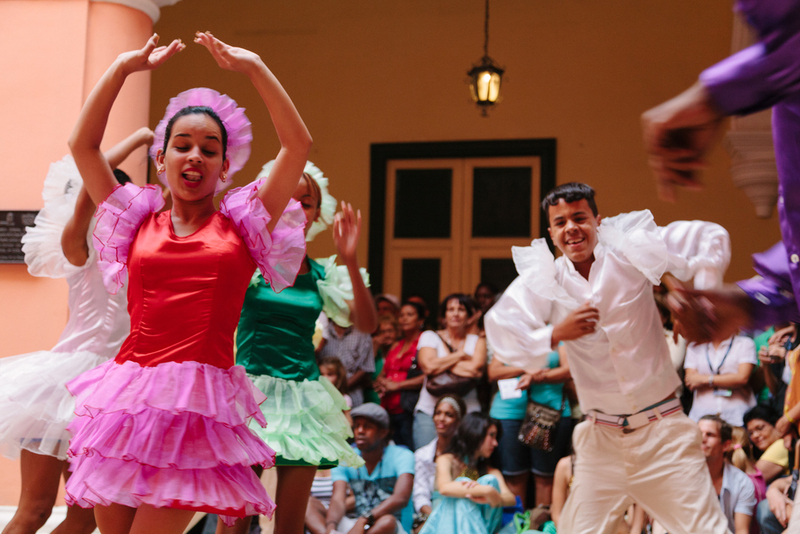 Performances begin in the afternoon lasting until the night-time, rotating through various venues in Havana Vieja. A live band with dancers on stilts (comparsa) takes spectators from one venue to the next. All of the shows are free. It is highly attended event by Cubans and visitors alike; the venues are packed. Performances styles include a range from traditional Cuban dances (son, casino, rumba and yoruba) to contemporary dance, ballet, hip-hop and capoeira; it all depends on who applies! This year's festival takes place from April 15-19, 2015; the deadline to submit an application is March 15, 2015. Check the festival website if you'd like to participate this year.